At Culler Plumbing, one of the services that we offer is water jetting, but we often get asked what water jetting is and how it can benefit our customers. Water jetting is one of the many ways that we save our customers money. Sure, we could relieve a clog or a backup, knowing full well that we will soon be called out to fix the same issue. However, we believe the best practice is to solve the root issue to completely eliminate a problem. This saves our customers the hassle of repeat calls and avoids bigger issues such as burst pipes and flooding. This article will help shed some light on what water jetting is and how it can help your residential plumbing system. Water is one of the most powerful moving forces on earth. Water jetting harnesses the power of water under pressure to clean buildup out of pipes and drains. The process of water jetting is done by propelling high-pressure water into drains or sewer lines to push out blockages. We use nozzles and attachments to target specific areas within pipes with concentrated streams of water. High-pressure water jetting essentially scrubs the inside of pipes to get all of the stuck-on debris out. High-pressure water jetting is effective at removing all sorts of tough-to-remove substances that other forms of pipe cleaning are unable to effect. This includes heavy roots; fat, oil, and grease (FOG); mud, sand, and gravel; hardened scale, and most other obstructions. In sewer lines, water jetting can remove sludge that is created from the buildup of organic matter as well as foreign objects and paper products that can get stuck. 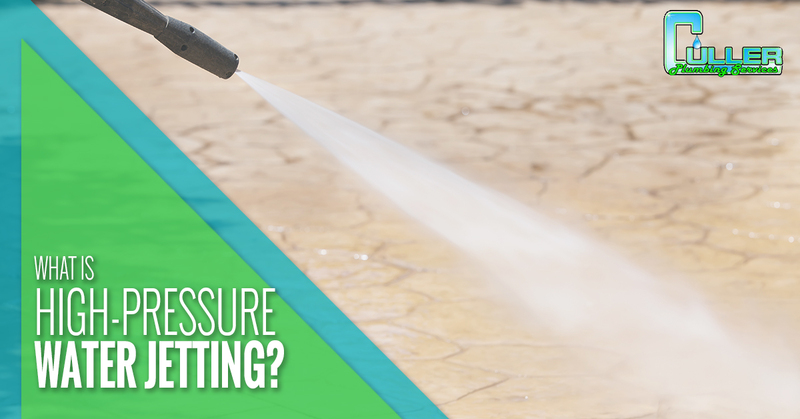 High-pressure water jetting works well on most residential and commercial pipes. Most businesses would benefit from a water jetting blow-out once or twice a year and most residential homes can stand to go several years between water jetting treatments, problem free —assuming proper plumbing care is being done. The places that most benefit from regular water jetting treatment are restaurants, food service business, hotels, schools, and hospitals. These places have high volumes of the wrong things entering the pipe system including FOG, hair, and paper products. Water jetting is a great alternative to harsh chemicals that can corrode pipes along with the matter it is supposed to be removing. Cable machines are often used to remove tree roots and other solid obstructions, but are not as effective with softer debris; whereas, water jetting can remove it all. High-pressure water jetting has been used to remove buildup that was not successfully removed with an auger or eel machine! If blockages are not entirely removed, they can continue to cause problems that may lead to flooding and property damage. At Culler Plumbing, we are water jetting experts. We use various water jetters to suit the lines you need cleanes. We can use high-pressure water jetting to clean pipes in any size ranging from one and a half inches to 24 inches. We are a Top Rated® Local Plumber, fully licensed, bonded, and insured. Call to schedule our water jetting appointment today!